All SKUs will be available for pre-order and purchase through rightstuf.com and Aniplex ‘s official retailers (Aniplexusa.com/retailers) from Tuesday, May 28. Each Limited Edition Set is containing the show episodes on 3 Blu-ray discs along with an Original Soundtrack CD, an exclusive DVD featuring interviews with the English voice cast. In addition, inside a deluxe rigid box illustrated by Manga Author Kazue Katō , clear BD cases with double-sided wraps of Japanese cover design, there will be a deluxe 36 page illustration booklet. As bonus contents on both Blu-ray and DVD discs, there will be an unaired special episode “Kuro Runs Away from Home” as well as the comedic “Ura-Eku” short clips, “web version preview” videos, trailer collections and more! The Limited Edition Blu-ray Box Sets will be distributed in limited quantities and sold through while supplies last. Based on the manga by Kazue Katō (published on Jump Square by Shueisha ), Blue Exorcist successfully depicts a hero, Rin Okumura, an energetic, yet naïve young man who aims to become the ultimate exorcist. The manga has been made into television series by the hands of Japan’s acclaimed staff including director Tensai Okamura ( Wolf’s Rain , Darker Than Black) and Animation Studio A-1 Pictures ( Sword Art Online , Oreimo 2 , Persona 4 , Welcome to THE SPACE SHOW ). Blue Exorcist was originally broadcasted in 2011 and was also adopted into a motion picture release. Aniplex of America Inc. (Santa Monica, California) is a subsidiary of Aniplex Inc. (headquartered in Tokyo, Japan), a group of Sony Music Entertainment (Japan) Inc. and leading provider of anime content and music production and distribution in Japan. 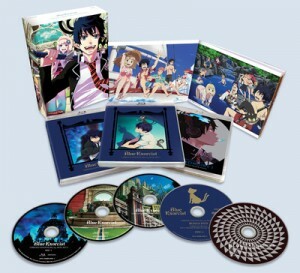 Aniplex of America has launched fan-favorite DVD and Blu-Ray releases such as Bakemonogatari , Durarara!! , Puella Magi Madoka Magica , The Garden of Sinners and Blue Exorcist . The company’s ever-growing line-up of shows includes our most recent titles, Sword Art Online , Magi, Blast of Tempest , Oreshura and Vividred Operation . Currently celebrating its 23rd year in business, Right Stuf, Inc. was one of the first players in the U.S. Japanese Animation (“anime”) industry, as both an anime producer/distributor and a retailer. Right Stuf works to promote knowledge of its own products, as well as the anime and manga industry, through its online storefront at RightStuf.com and a variety of media including podcasts and special publications.